Mr. Wilson (87 yo) presents complaining of exhaustion, weakness, dizziness and difficulty doing activities of daily living (ADLs). His daughter says that he has been slowing down, seems confused and has been falling lately, despite the use of a walker. Upon further assessment, you identify that Mr. Wilson is moderately frail. Despite many of the misconceptions that exist, not all elderly people are considered frail. How Can Frailty Be Recognized in Your Patients? Objective determination of frailty has been defined using the validated Frailty Phenotype and Frailty Index. These tools are rarely used in clinical practice and mainly used for research purposes. Frailty can be assessed at any stage of patient care. As pharmacists, the Clinical Frailty Scale can be used to assess patients in both community and hospital settings to help drive the patient’s care. Why Should Pharmacists Assess Frailty in Patients? Assessment of frailty can help guide the creation of personalized care plans for your patients, with the goal of maximizing the likelihood of achieving positive outcomes.2 This challenges pharmacists to think about the efficacy and safety of interventions in the context of your patients, using their frailty level as a marker of prognostic value.2 Ultimately it comes down to risk versus benefit, and often times for these patients the risk of treatment outweighs the benefit. What Can Pharmacists Do to Help Improve Outcomes in Frail Patients? Five important things to consider when conducting a medication review on a frail elderly patient:9. Use an algorithm to help decide if a medication should be stopped. The Beers Criteria and STOPP are also useful resources for determining medications to eliminate or adjust. What Should We Do for Mr. Wilson? Pharmacists are encouraged to prioritize any changes with the patient and/or caregiver. Minor changes to a frail patient’s regimen can lead to significant improvement. By actively assessing a patient’s frailty and working with the patient and their prescriber, pharmacists can reduce a patient’s risk and improve their overall quality of life. With appreciation to Mike Boivin, B. Pharm. Back to the Case: What Should We Do for Mr. Wilson? 1. Boockvar, K.S. & Meier, D.E. Palliative care for frail older adults. “There are things I can’t do anymore that I wish I could” JAMA 2006; 296(18): 2245-2253. 2. Afilalo, J. et al. (2014). Frailty assessment in the cardiovascular care of older adults. Journal of the American College of Cardiology 2014; 63 (8): 747-762. 3. Houle, S.KD. et al. The 2014 Canadian Hypertension Education Program (CHEP) guidelines for pharmacists: an update. Can Phar, J 2014; 147(4): 203-208. 4. DiWang & Lam-Antoniades, M. Challenges of hypertension management in the frail very elderly with multiple co-morbidities. CGS Journal of CME 2013; 3(1): 5-7. 5. Canadian Diabetes Association Clinical Practice Guidelines Expert Committee. Canadian Diabetes Association 2013 Clinical Practice Guidelines for the Prevention and Management of Diabetes in Canada. Can J Diabetes 2013;37(suppl 1):S1-S212. 6. Fried, L.P. et al. Frailty in older adults: evidence for a phenotype. Journal of Gerontology 2001; 56(3): M146-M156. 9. Yong, T.Y. & Khow, K.SF. Prescribing appropriately in frail older people. Healthy Aging Research 2014; 21(4): 1-12. 10. Walston, J. et al. Research agenda for frailty in older adults: Toward a better understanding of physiology and etiology: Summary from the American Geriatrics Society/National Institute on Aging Research Conference on Frailty in Older Adults. Journal of American Geriatrics Society 2006; 54(6): 991-1001. 11. Li-Xue, Q. 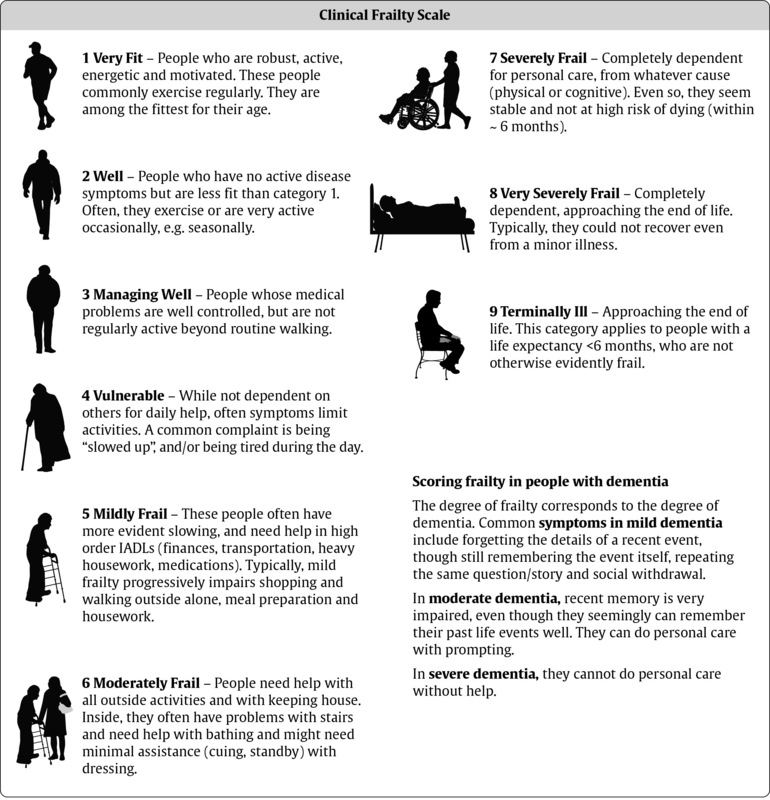 The frailty syndrome: definition and natural history. Clin Geriatr Med 2012; 27(1): 1-15. 12. Rockwood, K. et al. A global clinical measure of fitness and frailty in elderly people. CMAJ 2005; 173(5): 489-495.